Every now and then I come across stories in the history of Beccles which beg to be re-told. Sometimes these stories relate directly to one of my ancestors and this thrills me no end. Then there are those stories which affect me personally because they are tragic tales; for instance, my step-mother's paternal grandfather who, in 1943, was killed at the crossways of Station Road and Smallgate. William Denson, aged 63, of 5 Denmark Road, Beccles left his house at around 10am on Saturday 17 July, to visit friends who lived in London Road. Waving goodbye to his wife, Frances Lilian Denson, in his usual good spirits, his last words to her were, "I shall not be gone long." At approximately 10.30am, in response to a telephone call, PC Smith attended the scene of a traffic accident on the corner of Station Road, near the Public Hall. There he found a three-ton lorry loaded with shingle, which was two feet on the nearside path into Station Road, facing east. Dr Grantham-Hill and Supt CW Chiddel, of Beccles Division of the St John Ambulance Brigade, were rendering first-aid to a male cyclist, who was lying just behind the lorry. The lorry driver, Roger Scott, aged 19, from Wales, was visibly shaken and was sitting in his cabin. Scott later told PC Smith that he had earlier called at a café for a cup of tea and was proceeding down Market Street, his speed as he approached the crossroads in third gear being about 10 mph, sounding his hooter several times. The crossroads appeared to be clear, but as he was almost over them, travelling close to his near side, he suddenly saw a cyclist on his off side. An ambulance arrived to take William Denson to Beccles Hospital where he later died from injuries incurred by the fatal collision. I can only imagine the impact this would have had on 19 year old, Roger Scott. 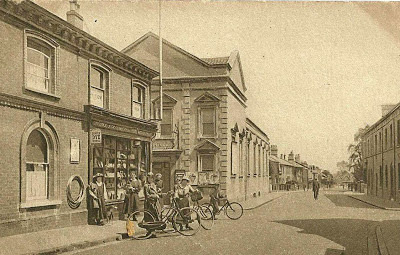 Postcard: Station Road, Beccles. Public Hall on the left. This shows the very corner where William Denson was killed. William Denson was born in Glemsford in West Suffolk. He served his apprenticeship as Printer Compositor at Sudbury and later worked in Tunbridge Wells before settling in Beccles. He worked for almost 40 years at the Caxton Press. He left a widow, Frances, aged 53, and two sons; Frank and Kenneth. Frank was my step-grandfather. In 1911, at the time of the census, William Denson was aged 31 and was a boarder at 5, Denmark Road. The house was occupied by widow, Amelia Leon, aged 53. Her two daughters, Florence Amelia and Frances Lilian, were also recorded on the census. Frances, aged 21, was a Bookbinder and worked at the Caxton Press with William. William Denson and Frances Leon were married in 1912 at St Michael's Church in Beccles. At the time of William Denson's tragic death, World War Two was raging and both of his sons had both joined the Royal Air Force. Frank Denson, who was a Leading Aircraftman at the time, was a monotype operator at the Caxton Press prior to joining up. Both sons would have heard the tragic news of their father's accident and subsequent death via their superiors or through a telegram sent by their mother.